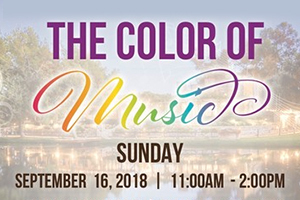 Save the date for September 16th, when Vitagliano Vineyard and Winery presents The Color of Music. Spend the afternoon enjoying distinctive art, live music, wine and delicious cuisine that can be purchased at onsite artisan food trucks. This special event is from 11 a.m. to 2 p.m. and will feature artist Lynnea Oakes and jazz music by The Andrea Miller Quartet. Admission is $10 per person. Buy your tickets today! Back to School Blues? We have a solution! 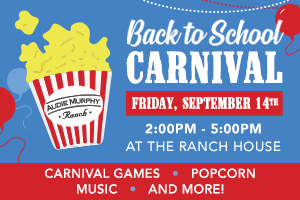 Join us for a Back to School Carnival at the Ranch House at Audie Murphy Ranch on Friday, September 14th from 2-5pm. This afternoon of fun will include carnival games, popcorn, music and more! Be sure to check out our seven new neighborhoods while you’re there! The city of Temecula is hosting a special evening to commemorate the 17th anniversary of September 11th. Write a message in the Keepsake Journal and take some time to reflect as we honor those who tragically gave their lives in service to this country. There will also be light music and refreshments following the program, which is free to the public. 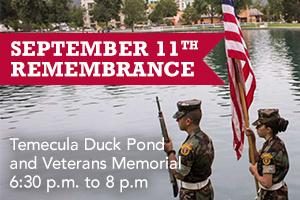 The September 11th Remembrance is at the Temecula Duck Pond and Veterans Memorial from 6:30 p.m. to 8 p.m.